Pavel Alekseyevich Cherenkov (Russian: Па́вел Алексе́евич Черенко́в [ˈpavʲɪɫ ɐlʲɪˈksʲeɪvʲɪtɕ tɕɪrʲɪnˈkof], July 28, 1904 – January 6, 1990) was a Soviet physicist who shared the Nobel Prize in physics in 1958 with Ilya Frank and Igor Tamm for the discovery of Cherenkov radiation, made in 1934. Cherenkov was born in 1904 to Alexey Cherenkov and Mariya Cherenkova in the small village of Novaya Chigla. This town is in present-day Voronezh Oblast, Russia. In 1928, he graduated from the Department of Physics and Mathematics of Voronezh State University. In 1930, he took a post as a senior researcher in the Lebedev Physical Institute. That same year he married Maria Putintseva, daughter of A.M. Putintsev, a Professor of Russian Literature. They had a son, Alexey, and a daughter, Yelena. Cherenkov was promoted to section leader, and in 1940 was awarded the degree of Doctor of Physico-Mathematical Sciences. In 1953, he was confirmed as Professor of Experimental Physics. Starting in 1959, he headed the institute's photo-meson processes laboratory. He remained a professor for fourteen years. In 1970, he became an Academician of the USSR Academy of Sciences. Cherenkov died in Moscow on January 6, 1990, and was buried in Novodevichy Cemetery. 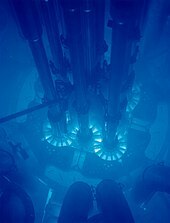 Cherenkov radiation is named for his discovery of the phenomenon; pictured here glowing is the core of the Advanced Test Reactor. In 1934, while working under S. I. Vavilov, Cherenkov observed the emission of blue light from a bottle of water subjected to radioactive bombardment. This phenomenon, associated with charged atomic particles moving at velocities greater than the phase velocity of light, proved to be of great importance in subsequent experimental work in nuclear physics, and for the study of cosmic rays. Eponymously, it was dubbed the Cherenkov effect, as was the Cherenkov detector, which has become a standard piece of equipment in atomic research for observing the existence and velocity of high-speed particles. The device was installed in Sputnik 3. Pavel Cherenkov also shared in the development and construction of electron accelerators and in the investigation of photo-nuclear and photo-meson reactions. Cherenkov was awarded two Stalin Prizes, the first in 1946, sharing the honor with Vavilov, Frank and Tamm, and another in 1952. He was also awarded the USSR State Prize in 1977. In 1958, he was awarded the Nobel Prize in Physics for the discovery of the Cherenkov effect. He was also awarded the Soviet Union's Hero of Socialist Labour title in 1984. Cherenkov was a member of the Communist Party of the Soviet Union. The name of Star Trek character Pavel Chekov was chosen as a tongue-in-cheek reference to Pavel Cherenkov. In Starship Troopers spaceships travel faster than light using Cherenkov Drive. ^ Chudakov, Alexander E. (December 1992). "Obituary: Pavel Alexeyevich Cherenkov". Physics Today. 45 (12): 106–107. Bibcode:1992PhT....45l.106C. doi:10.1063/1.2809928. Archived from the original on 2013-10-04.